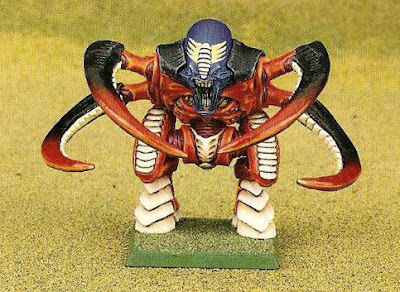 With a little helpful suggestion from a Warpshadow member, I came up with the idea of cataloguing the genesis of the Tyranid model range since its introduction way back in the fuzzy mists of Games Workshop history. It's something I've always been kind of obsessed with: keeping track of older models and making sure that newer modellers knew where their beloved bugs originated. What's more, this is the year 40K turns 25, so what better time to look back on our beginnings? Thus, this will be the beginning of The Tyranid Archive, a historical look back on where Tyranids came from and how far they've come. I'm not really sure how to proceed with this, so I'll divide up the models in by generation, including dates and additional anecdotes where I can. That being said, I've only been keeping pace with the Nids since 2nd Edition/their first codex, so most of this post will be based on only what I've heard/read about after the fact. If you're reading this, and you've got interesting stuff to contribute or if I've gotten something terribly wrong, please tell me in the comments below. 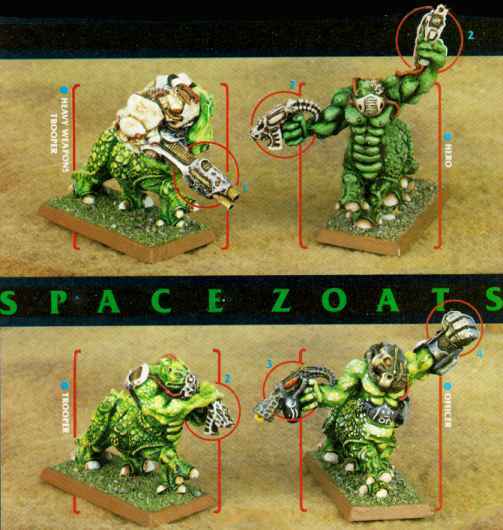 The dominators, it would seem were eventually massaged into a more cohesive concept in the form of the Zoats, a race of centaur-like, Tyranid creatures that roved ahead of the swarm and...negotiated...(!?) with the other races of the galaxy. 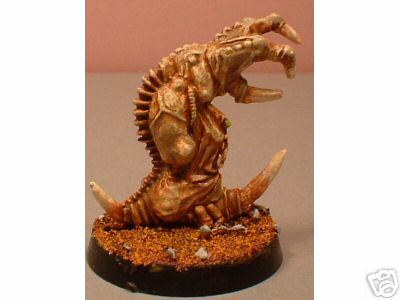 However, when you've got a Hive Fleet full of gribbly space aliens, intent on devouring any and all biomatter in their path, negotiations make little sense, so though they were neat models, the Zoats were eventually phased out of the Tyranid line. Still, some of our most recognizable, persistent strains of Tyranids had their humble beginnings way back in the days of Rogue Trader/First Edition of Warhammer 40,000. 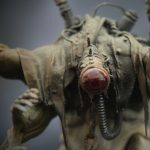 Creatures and concepts that started out seperately as the freakish Tyranid Grabber Slasher and the muppet-looking Tyranid Swarm would eventually be streamlined into a single unit that we now refer to as a Ripper Swarm. 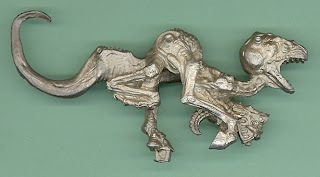 Then again, now that I think on it, I'm not sure if the Grabber-slasher was a proto-ripper or a proto-lictor as its fluff had it crawling through rafters and dropping down to assassinate its prey. 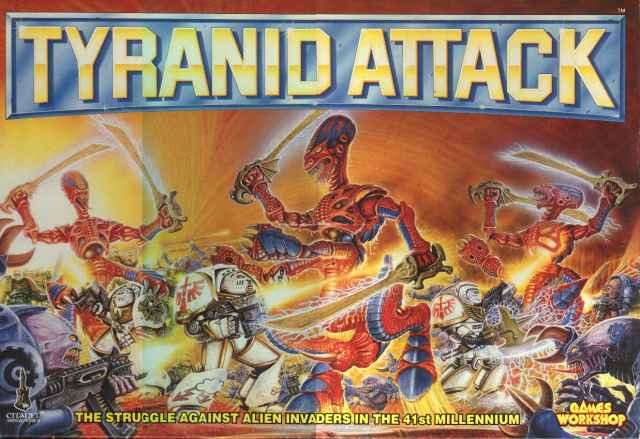 There were, of course, Tyranid Warriors to lead the broods. 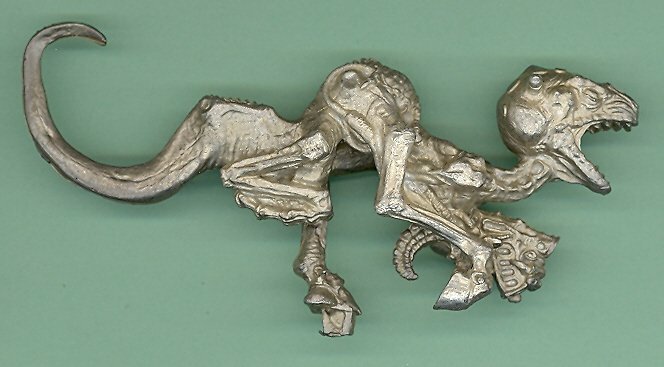 They were cast in metal and were the first Tyranid units to carry boneswords. 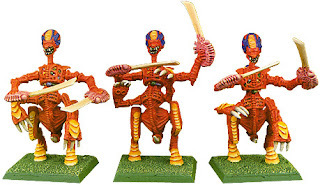 Following along in their thrall were the realization of the Proto-Tyranid concept, the fore-runers to gaunts that then went by the name of Hunter-Slayers. Now, there is one more model that I believe to have been created and released late in first edition (based solely on the fact that it originally had a two-part, hyphenated name and I've seen photos of it painted with the odd head markings that Rogue Trader Tyranids featured), but I could well have been released during the early days of second edition. I'm pretty sure it's the model that got me interested in Tyranids (and, by extension, 40k) in the first place when I pulled it out of a friend's gaming case, and even with all the leaps and bounds of computer-aided, injection-molded, plastic sexiness of current miniatures, this old, metal model may still be my favourtie. It was sculpted by a young up-and-comer at GW who went by the name of Jes Goodwin and was destined to aesthetically define broad swathes of the universe we all know and love. What I'm dancing around is, of course, the Screamer Killer. And back then that was as big as the Tyranids came: a sickle-bladed, bio-dreadnaught (I think someone told me the Screamer-Killer had armour values, but maybe I'm making that up...). There were no Tyrants or walking artillery batteries or bloated-headed, psychic lascannons. 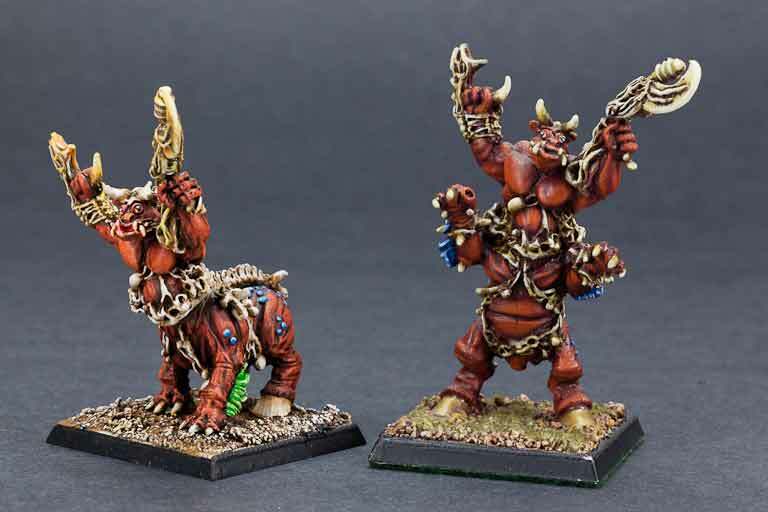 Fortunately, the Nids were in for a refresh, and what a refresh it was destined to be! Wow, I have never even heard of the Dominators before. Cool stuff. 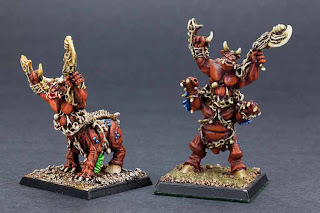 I am pretty sure that the Hunter Slayers came out before the Rippers. I think that the Hunter Slayers came out at the same time as the Zoats. The Rippers themselves were originally ork squigs (from the Ere We Go and Freebooterz era) that were subsequently retconned to be Rippers. I think that the Grabber Slasher was made around the same time as the metal Warriors and Screamer Killer shown (soon after Advanced Space Crusade was released). I wish that I still had a couple of the Grabber Slasher figures. Cool post. I am looking forward to the follow ups. Thanks so much for the history, MP. :) It's really interesting to see where our beloved bugs came from and how the fluff has evolved as well. You are correct. The Screamer-Killer was, in fact, a late 1st-edition model.